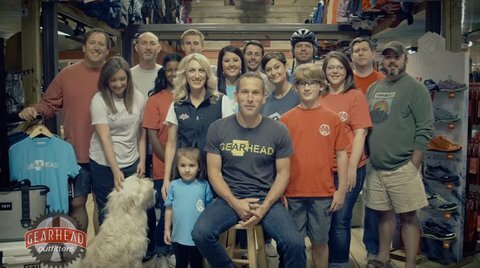 Gearhead Gives is the charitable arm of Gearhead Outfitters. Our mission is simple—to give back to the communities we serve. In 2015, Gearhead employees and brand ambassadors served more than 1200 hours in our communities through community service events, special projects and activities. We were also able to donate thousands of dollars to various charities throughout the year to benefit organizations such as Out of the Dark, City Youth, the Ozark Highlands Trail Association, veterans organizations, and many others. This year, we're challenging ourselves to increase our commitment to our communities! We have set an internal goal of 2,000+ service hours for our staff and brand ambassadors. We hope to reach our goal through their hard work and dedication to the organizations they are passionate about. Help contribute to our goal by volunteering at one of your local Gearhead Outfitters events. You can find them on our Facebook page or our website. Let us know if you have any upcoming volunteer opportunities for your organization. We'll spread the word! Let us know if your non-profit would like to be considered as an event partner this year. You can sponsor our events to help us give even more back to our beneficiaries! Throughout the year, we will share blog posts that will allow you to get to know our staff on a deeper level. We will tell their stories of service and the organizations that are close to their hearts. We appreciate your support throughout the year as we host benefits nights, educational programs, and special events that offer exciting opportunities for our loyal customers. We couldn’t do what we love without your help.